A mahogany bergere chair believed to have been used by Napoleon Bonaparte has been rediscovered at a Kent museum. It was brought to Maidstone by the Reverend Richard Boys, a chaplain on the South Atlantic island of St Helena and vicar of the Kent village of Loose. The chair was used by Napoleon when he visited his St Helena home. Damage caused when he reportedly scraped a penknife across it is still evident. 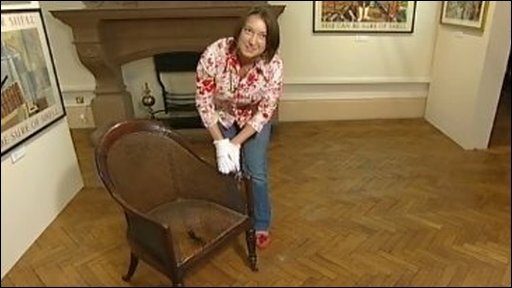 The chair was on display at Maidstone Museum until it was stored in 1996. Museum staff came across it as they were preparing for the development of the east wing. According to the museum's accession register, the chair, which dates back to the start of the 19th Century, was donated by local councillor Alexander Randall in about 1866 following the death of Mr Boys. Councillor Brian Moss, of Maidstone Borough Council, said the chair was in good condition apart from its cane seating, which would need restoring. 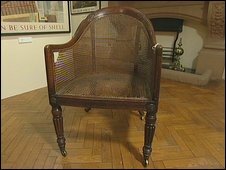 "There is also damage to the right arm of the chair, which was allegedly caused by Napoleon scraping it with a knife. "It has a really interesting story and it will soon be on display in the east wing extension," he said. Napoleon Bonaparte was born on 15 August 1769 and became Emperor of France in 1804. He died on the island of St Helena on 5 May 1821.